Introducing Oscar Pistorius - "The Fastest Man With No Legs"
Who: Every now and then a person comes along and challenges what we perceive to be normal, and forces the world to reevaluate how the rules are made. 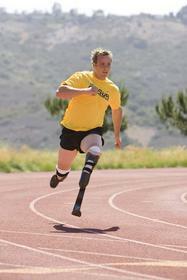 Oscar Pistorius from Pretoria, South Africa is such a man. The 20-year-old -- a double amputee born without the fibula in both legs -- currently holds Paralympic world records in the 100m, 200m and 400m sprint, and has now set his sights on competing in the 2008 Olympic Games. Running on Ossur's carbon fiber feet, called Cheetahs, he is racking up times that would have been good enough to win gold in the women's 100m, 200m and 400m sprints at the last Olympic Games, and is regarded as having the potential to best men's able-bodied Olympic times today. But the world body governing athletics, the International Association of Athletics Federations (IAAF), has already moved to block him from the Olympics, with a temporary new ruling banning "technical aids," which "provide(s) the user with an advantage over another athlete not using such a device." The ruling will become permanent at the IAAF's annual meeting in August of this year, if unchallenged. Meanwhile, eminent scientists and doctors from around the world are disputing the ruling, stating that no studies have been conducted that would prove that he has an advantage. Mr. Pistorius now finds himself at a historical crossroads, defending not only his cause but that of every disabled athlete who might, in the future, be in a position to compete in the Olympics. Meet: He's training to qualify for the 2008 South African Olympic team. But will he be allowed to test his mettle against the best able-bodied athletes in international competition? He believes that if he can qualify he should get the chance. Mr. Pistorius looks forward to answering your questions. Watch: Oscar Pistorius will demonstrate his running technique, as well as his Cheetah Flex-Feet. What: Ossur (www.ossur.com) the developer and maker of the most scientifically advanced orthopaedic innovations in the world -- including the Cheetah Flex-Foot, the prosthetic device worn by every sprinter who medaled at the 2004 Paralympic Games in Athens -- and Armory Track & Field www.armorytrack.com, take pleasure in introducing Oscar Pistorius to New York City.